After two weekends in a row of spring snow storms we finally had a sunny spring weekend, and I celebrated by letting the pullets out for some sunshine. Pullet is the name for a hen before she begins laying. Tiki, pictured below, is 9 weeks now. They all enjoyed exploring the yard, pecking and scratching in the dirt, and sunning under their wings. After the intrepid explorers had their fill they settled in for a sunny nap, showing off their natural camouflage. And boy are they are growing fast! That’s our 7 week old Buff Orphington Korma in the middle. She’s flanked by our two 6 week old Ameraucanas/Eater Eggers, Tandoori on the left and Vindaloo is on the right. Tandoori is normally such a camera-whore I can’t believe she shunned the camera for this shot! We also have a 5 week old Silver Laced Wyadotte, not pictured. They are really showing their individual personalities now! Each one has their own ‘voice’ and I look forward to how they continue to develop. The 4 of them are getting pretty big for the small cage I’ve set up for their brooder, and I hope weather will permit me to put them out in the coop in about 3 week’s time. Korma could go out sooner, but I don’t want to separate them so I’m waiting for Tiki to fully feather before putting the group outside. I’ve also discovered treats that they like, and others they couldn’t care less about. Currently, apple and fennel greens are the winners. Freeze dried meal worms (much to my surprise) are the losers. I have to say, I’ve spent way too much time just watching them go about their daily business – it’s delightfully meditative and entertaining! Korma is our Buff Orpington in the flock. 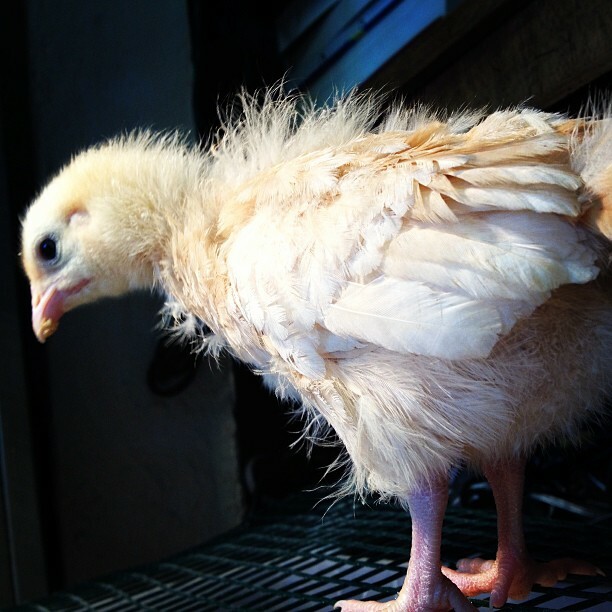 She’s about 4.5 weeks old and she’s clearly hit the in-between-fluffy-and-fully-feathered stage. She’s by far the quietest and the least flighty of our four chicks, a delight to handle. She may also be the silent head of the flock, we’ll see if that shifts as they age. When she’s comes of age (by June I hope) she’ll lay lovely brown eggs. Or at least they will be come summer! 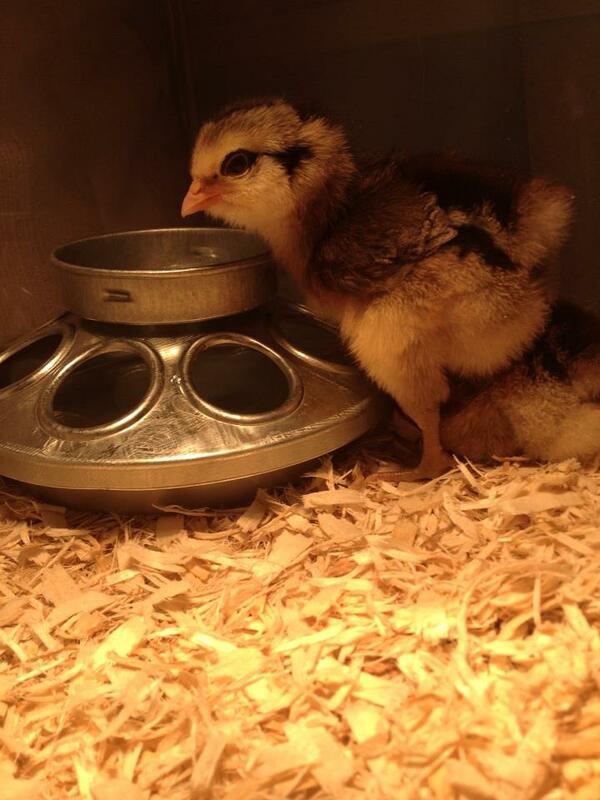 For now, I have chicks. In fact, I have four. Our little flock is comprised of two Ameraucanas (who lay blue eggs! 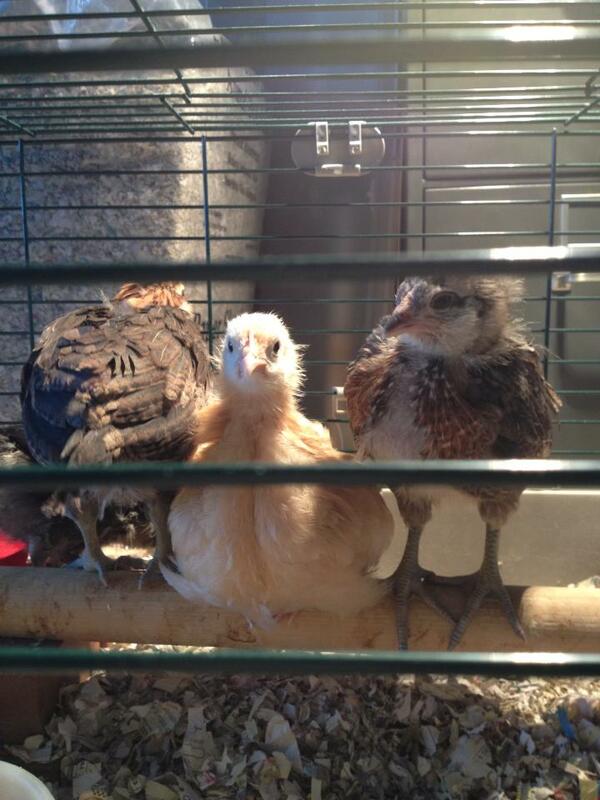 ), one Buff Orpington, and one Silver Laced Wyandotte. If all goes well, they should be laying by June and I’ll have more fresh eggs than I know what to do with. I’ll also have fresh manure for my vegetable garden and the very best pest control mother nature offers! Not too mention, endless entertainment. I’ll be posting about this new adventure regularly and passing on what I’ve learned for those interested in backyard chickens.